Is there anyone out there who doesn’t eat a sandwich at least occasionally? I know many of us have one for lunch pretty much every day. I actually don’t eat them as much as I used to – I think I must have had one too many when I was young. I do love a creative sandwich when I go out for lunch, but unfortunately that’s not very often. At home I prefer to have deconstructed sandwiches for lunch– a few slices of chicken breast or turkey, a slice of cheese, some cut up veggies and instead of bread, I’ll have crackers or pita chips. All the essential parts, but just not assembled in the traditional fashion. Well, today is National Sandwich Day – so I’m shaking it up with another non-traditional take on a sandwich. This cranberry chicken salad is a great way to use up leftover cooked chicken, and it features some of my favorite fall fruits – cranberries and apples. If you think there’s something not right about a sandwich with fruit, you’re so wrong. Try it – I promise you’ll love it! The dried cranberries are chewy and the apple is crisp and they make regular old chicken salad a lot more interesting. 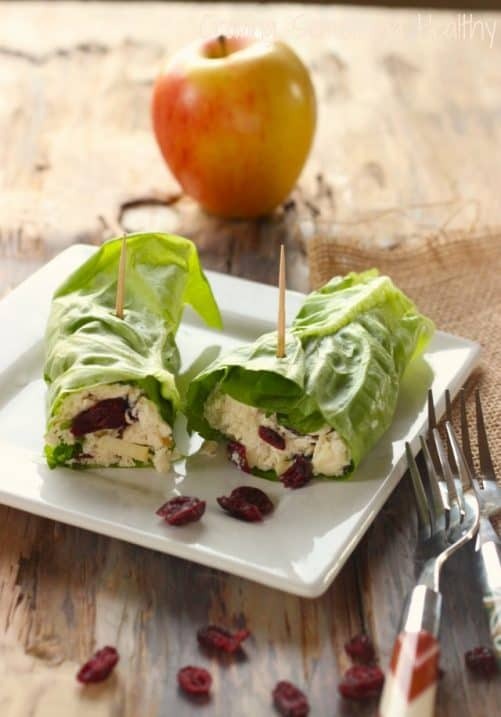 I used butter leaf lettuce instead of bread – it’s the perfect shape for rolling and it keeps the calories and carbs way down. Butter leaf lettuce also rolls up beautifully, nice and flexible, no cracking or tearing. Feel free to substitute a piece of whole grain flatbread if you prefer. That’s the beauty of the sandwich. No rules! Combine shredded chicken breast and yogurt in a medium bowl and mix well until combined. Fold in apples and cranberries. Add salt and pepper to taste. Spoon about 2 heaping tablespoons into the center of each lettuce leaf. Fold one edge in and roll tightly. Repeat with remaining lettuce leaves. Previous Post: « Happy Healthier Halloween! Lunchbox perfection! I love the idea of the added cranberries and greek yogurt is my ‘new mayo’. Didn’t take me long to make the switch and my arteries thank me every day! 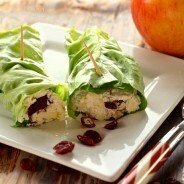 I love adding dried cranberries and apples to chicken salad. I am all about the sweet and savory combos myself. Great idea to use butter lettuce instead of bread. I should buy a head for lunches. These look delish! A great lunch for fall. Thanks for sharing this one Anne. I’m always looking around for good light lunches.